We had a high of 100 today, so I put off watering till my tomatoes were wilting. It was 8:00 PM, and still 89 degrees outside. I also did some pruning of the butterfly bushes in at dusk, and that made it a little difficult to distinguish what flowers were dead. I do not recommend pruning in the dark. I also do not recommend trying to put a nozzle on the hose while the hose is running. I also learned this from experience. The other day I’d forgotten that I’d taken the nozzle off till I had already crept through the bushes to turn on the faucet, so I just tried jamming it on there while the water was running. It’s a fabulous way to spray water all over yourself and cool off a bit. The insects sure seem to know how to beat the heat. The Japanese beetles are still systematically destroying my rose bushes. Enjoy your last meal, bastards, tomorrow you’re getting a lethal injection of pesticide! 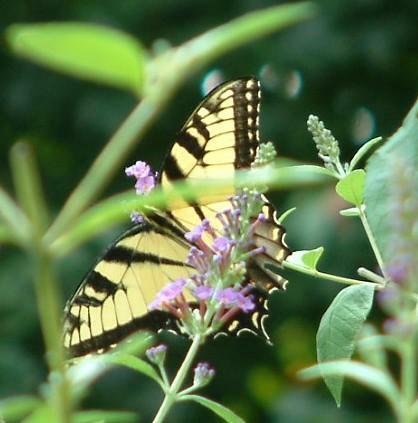 I also saw a yellow swallow-tailed butterfly yesterday in our front yard. Or should I say yellow swallowed-tail? The little guy was missing a section of one wing, although he seemed to be getting around OK. Pretty amazing, isn’t it? It’s 100 degrees outside, and he is flying around subsisting on flower nectar. Then he gets part of his wing chewed off and just keeps going. And we complain about a little heat wave. The photograph to the right was taken later of one of his butterfly buddies, also missing a small point of his lower wing. I’ve been trying to give away some extra plants, including some lovely stained-glass ferns and paper daisies. (Call now to reserve yours!) Some of the plants have found good homes, but others were not so fortunate. And yet I can’t bring myself to compost the rest. I’m also looking for a good home for several dozen irises. When I arrived to volunteer at the Roper Mountain butterfly garden yesterday, I discovered a wheelbarrow full of irises in the shed. I guess I’m not the only one to hoard plants in the hopes that they’ll find a home. Gardeners seem to have an innate revulsion to wasting plants or plant matter. After thinning the iris beds for a second day, we had further bags and buckets full of iris rhizomes that we felt compelled to find homes for. Churches? Habitat houses? Schools? There has to be someone needy for irises. And the excess iris leaves were used for mulch in the garden. Overheard from one of the kids touring the garden-- "Hey, that's a Japanese beetle! They eat everything!" We saw a few butterflies who seem to be enjoying their garden home. One visitor was our state butterfly, the Tiger Swallow Tail. 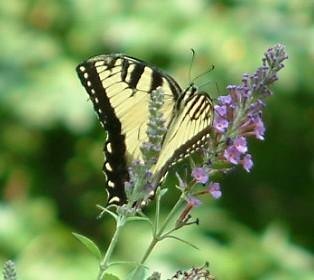 To the left is a Tiger Swallow Tail I photographed in my own yard. 1. Immediately after you water your garden, it will storm. 2. If it looks like it’s going to storm, and you skip watering that day, the storm will blow over. 3. Every time you go out to water the flowers on your front porch, you will forget about the nearby hornets' nest. 4. If you plant a mystery plant in the full sun, you will discover its identity later as a shade plant. 5. If anyone “helps” you out by weeding, he or she will destroy your favorite plant. 6. If you buy 3 bags of mulch to cover an area, you’ll end up needing 4. 7. If you give up on a plant and leave it to die, it will make a comeback. 8. There are a few plants that require almost no care, and in fact you couldn’t kill them even if you wanted to. These plants include crab grass, honeysuckle, kudzu, and poison ivy. 9. If a Japanese beetle has the choice to dine at the leaves of your rose bush or the ugly bushes in your neighbor’s yard, they will always pick your rose bush. 10. The garden hose is always too short to reach where you want and too long to coil efficiently. I'm a fan of Bill Murray after enjoying movies like Groundhog Day , Lost in Translation, and Little Shop of Horrors. And by now you should know how I feel about plants, flowers, and all things botanical. So when I noticed that Bill Murray is staring in a movie coming out soon called Broken Flowers, I'm as ravenous as an aphid on a rose bush to go see it. Most of you are probably familiar with this botanical classic, but you might not know that long before the Broadway musical and spin-off movie musical, there was an original cult classic B-movie version. The original version offers a cameo by a young Jack Nicholson, a surprise ending, and all the frills of a typical low-budget movie. And the original is not a musical, which is a plus in my book. The musical version of The Little Shop of Horrors is entertaining, however. Steve Martin gives a great performance as a sadistic dentist. And where else can you see a singing plant? These two movies made the top of my list because they are true gardening movies—they are focused around characters that have an obsession for plants. Greenfingers and Saving Grace are both British comedies, so these movies may be difficult to locate but very much worth the effort. Greenfingers is based on a true story of a British prison that gave inmates a chance to become gardeners, while Saving Grace is about a woman who finds herself penniless after her husband’s death and resorts to utilizing her gardening skills and resources on a special plant much different from her prize-winning orchids. The middle-section of my list is composed of great movies that happed to have botanical symbolism. Adaptation, with Oscar-nominated performances by Nicolas Cage and Meryl Streep, is a strange but mesmerizing journey loosely based on the novel The Orchid Thief. A Tree Grows in Brooklyn is also based on a best-selling novel, but be prepared for this movie to pull at your heart-strings. Bed of Roses is a romance, and if you are a true plant geek you will swoon over the most beautiful rooftop garden I’ve ever seen on film, not Christian Slater as a florist. White Oleander is a rather dark movie, but with great acting, including Lindsay Lohan’s breakthrough performance. Garden State was a great flick, and I could easily relate when I was going through my quarter life crisis. And I admit I have a celebrity crush on Zach Braff. He was a writer/director/actor in this film, but I first noticed him on Scrubs. I was googling him and came up with Zach Braff's Garden State Blog. Another cult classic. Whenever someone gets all hysterical about genetic engineering I think of this movie. Yeah, when we put a ethylene resistant gene into tomatoes, they could turn into the Tomatoes of Wrath! Whatever. If you have other movies worthy of this list, let me know.